I am able to repair / restore anything or make new to fit alongside the old. Some examples of past work can be seen in the galleries below. Please click on the images for description and enlarged view. Restoration of a tower skylight. 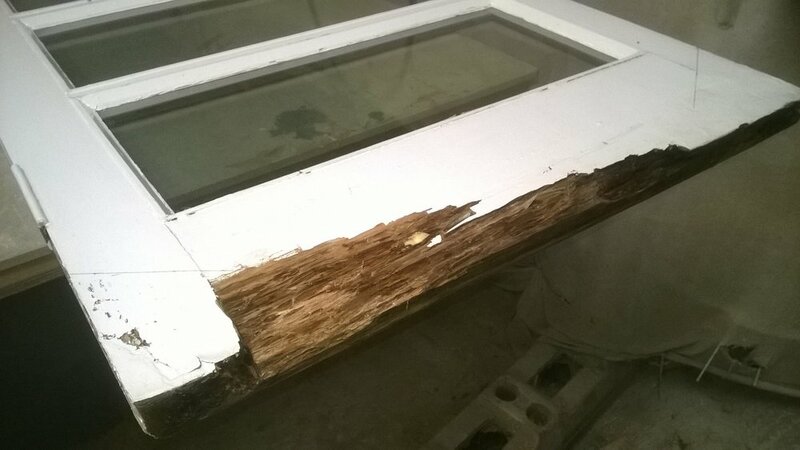 Poor quality timber and paintwork caused extensive rot in this tower skylight. The glass panels were failing due to exterior glazing bars, handling tape left on the double glazed units and poor silicone / sealing. Three of the main corner posts had rotted along with two windows and a few sections of framing. All replaced / repaired / reglazed and repainted with Zinsser & Farrow and Ball paint. All interior woodwork was black stained from condensation, sanded, stained and oiled to refresh. A weather beaten location, restored and good for many years to come. As is usually the case, the bottom sections of these windows had rotted out, the rest of the frame is still in good condition. The rot was cut away, new replacement sections machined in iroko, a naturally oily timber - very durable. 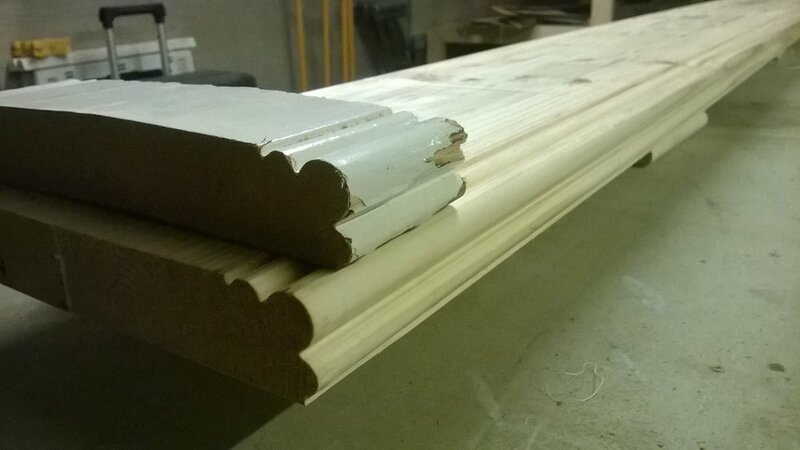 All mouldings matched and sanded / feathered back into the original framework. Once painted, the whole will be good for many years to come. 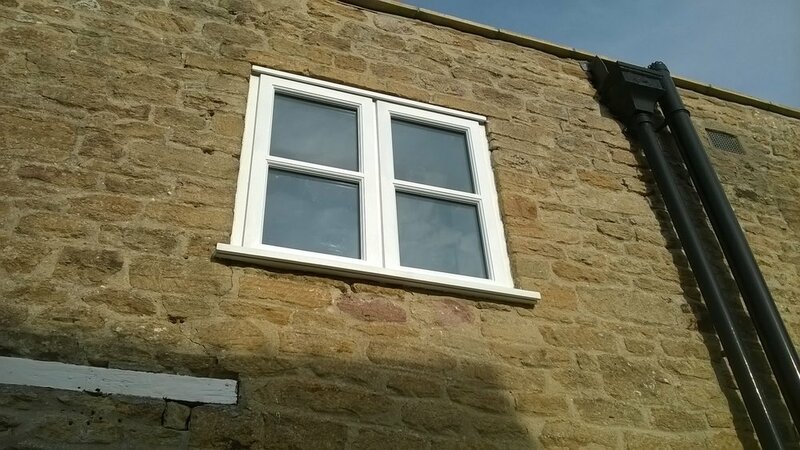 I see all too often, work made in lesser quality timber with insufficient original paintwork, poorly fitted glass and glazing bars fitted on the outside. These failings result in water ingress and rapid deterioration. These patio doors had all failed in the usual places, bottom rails and corners. More of the same project below, as you can see, sometimes only the bottom few inches needs replacing. 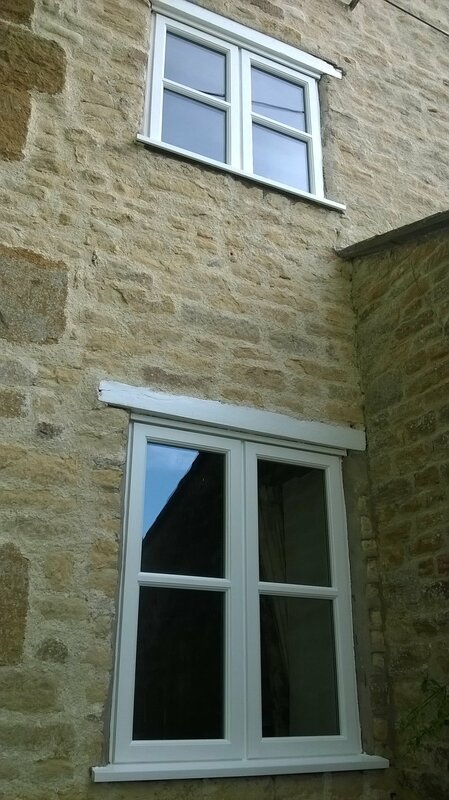 A replacement casement window for a listed building. 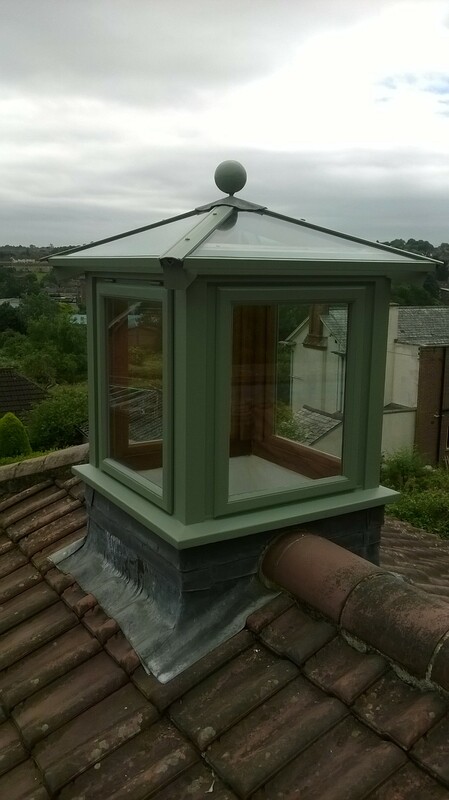 Made in hardwood to match the original, glazed, painted & fitted. Restyling / reglazing of windows. I was asked to alter several windows in an older house to make more inkeeping with the property. 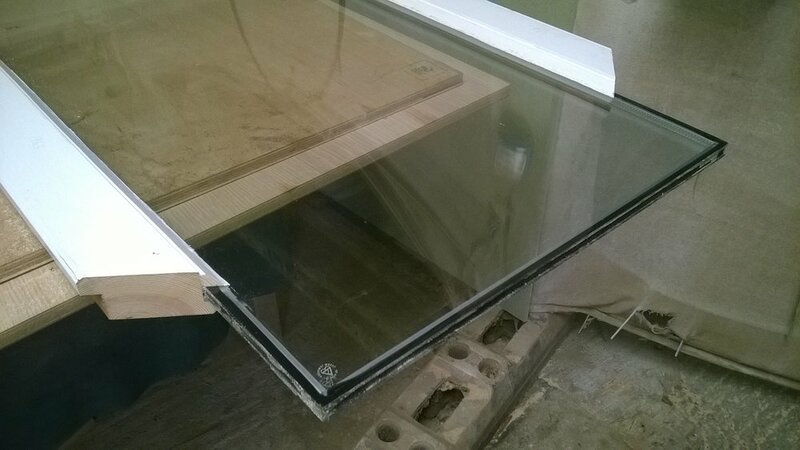 The original double glazed leaded units were full size in the frames, very thick and obviously modern. I removed all the units, made new horizontal dividing bars and refitted much thinner heritage double glazed units. 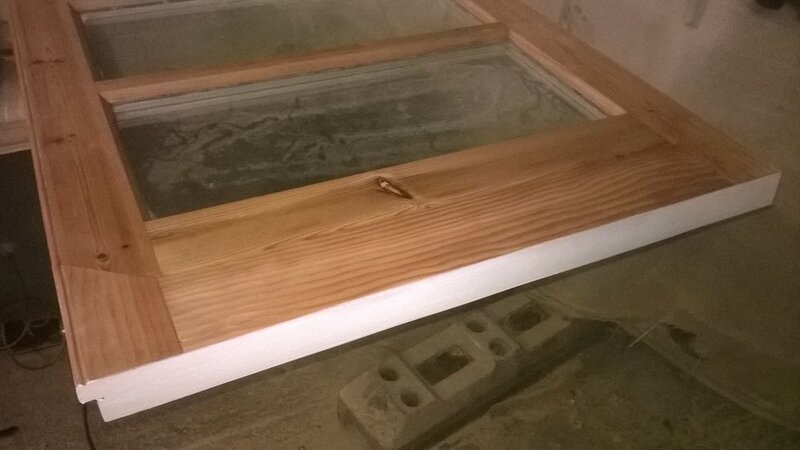 These were made using the very efficient edgetech super spacer for excellent insulation / cold transferance between outer and inner panes. The units were made using toughened glass which was argon filled and coated with heat relective film. 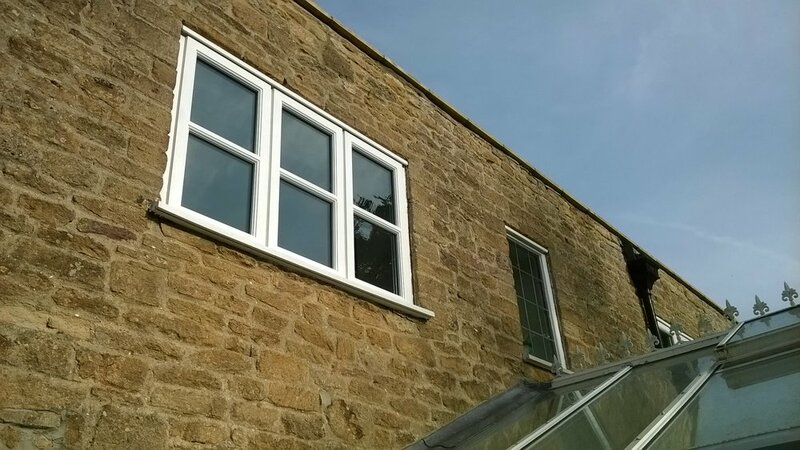 New heavier glazing bars give a period feel and hide the much deeper rebate left by taking the thicker units out and replacing with slim. 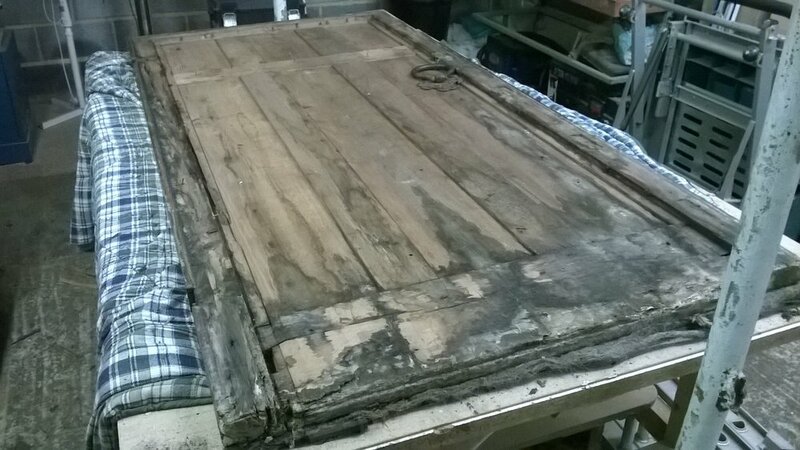 This oak door had gone way past its best and had typical rot at the base. The old threshold was also small and quite ineffective, a new one was made to fit the profile of the external step and lip onto the internal flagstones. All sits down and tight onto the stonework. It looks askew, this was intentional as the the door is twisted in the frame, everything matches up to provide a tight fitting finish. 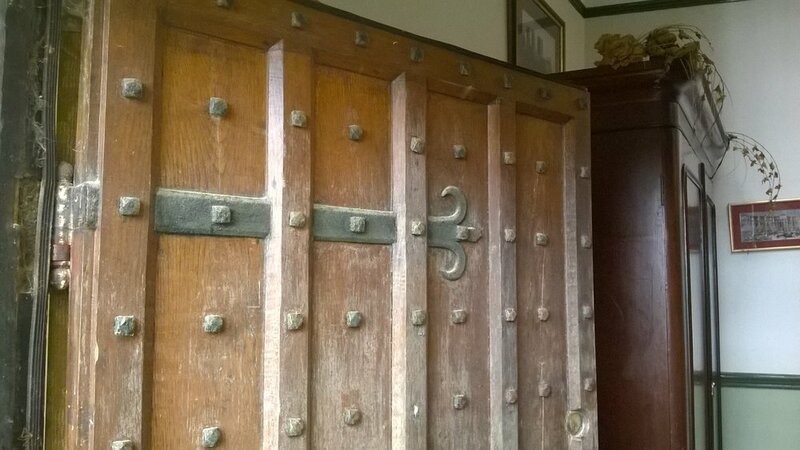 The first of three Victorian oak doors from one property in need of bringing back to life. The timber was cleaned, revived, coloured and then finished after repairs were made. 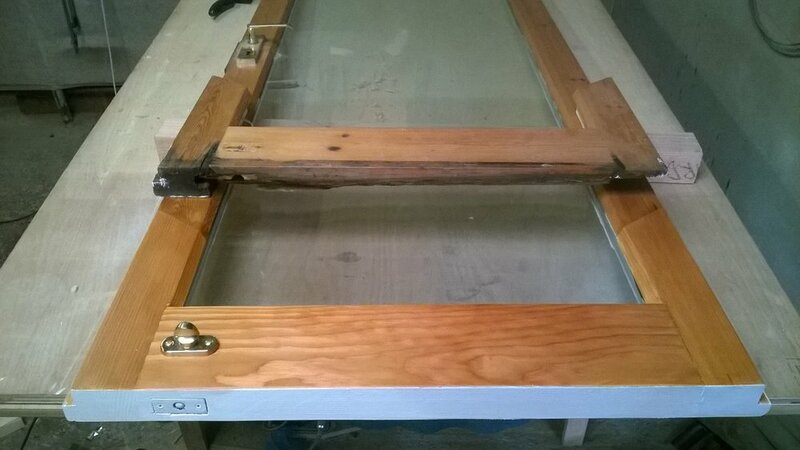 This door needed a new base rail fitting as the old had been badly cut off some years ago. This was replicated and then coloured in to match the original timber. The studs were all removed, these and all ironwork was cleaned, decoroded and repainted. The second of the three, this door needed all three centre staves replacing as well as the base rail. It was then given the same treatment as the first door to bring it back to life. The third door was in the poorest condition. This door took all the weather and had suffered badly for it. The whole of the the exterior planking was beyond repair. This was all made new from selected oak and the door was re-skinned completely. The 'inside' of the door was dried and treated before repairs were made. 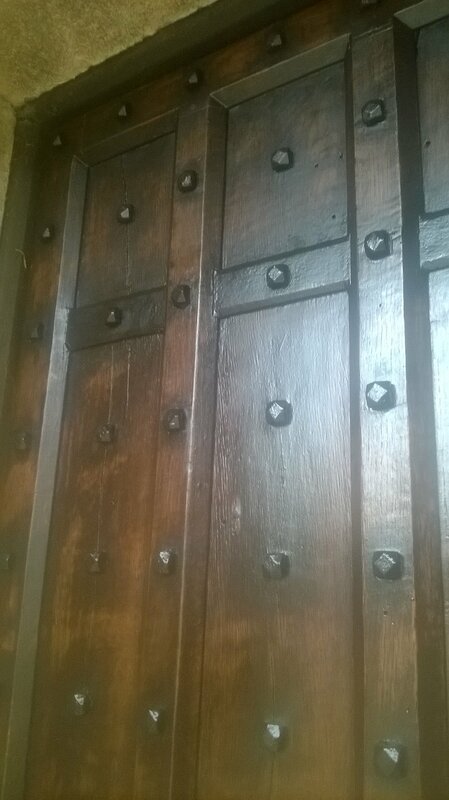 The studding had caused major splitting and staining to the original timber due to years of movement / weathering. It was decided that it would be better left off to ensure longevity of the timber. The base was epoxy filled and sealed to prevent future rot. A selection of start to finish photos can be seen below. 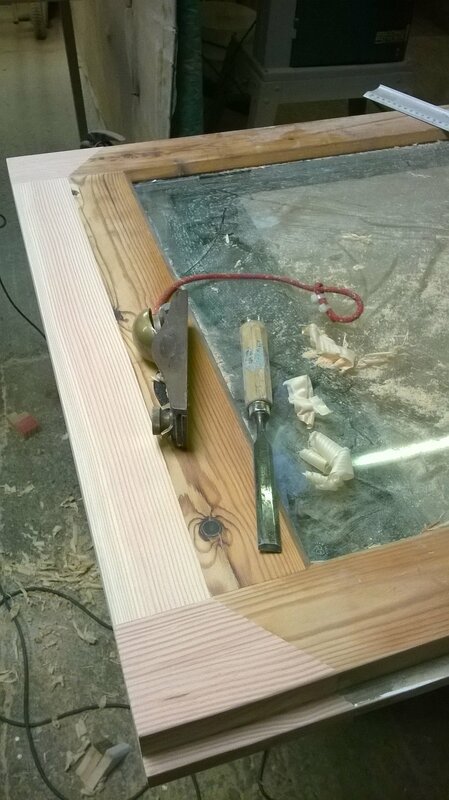 I was asked to build a solid oak framed windowsill, designed to allow someone to stand on the shelf to clean the window above and also to partially dismantle for access / inspection of the wall behind. As part of the work shown above, I was asked to replicate and fit the Georgian dado rail on the staircase and also make and fit a new vertical section in an arched surround. Patterns were taken from the original mouldings and bespoke spindle moulder cutters made for the work. An attractive oak door in need of repair and a refinish. 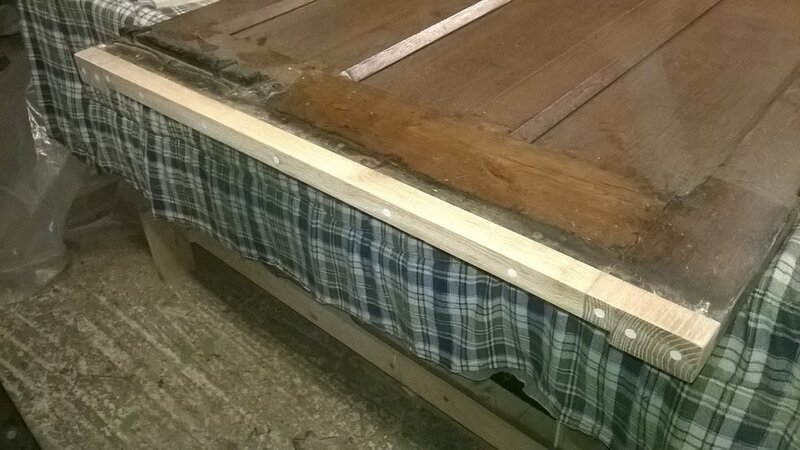 The base rail had rotted away and a standard but not strictly correct repair had been carried out in the past by way of a new plank fixed over the old to hide the rot. The bottoms of the stiles had also suffered and needing cutting out and replacing with new. 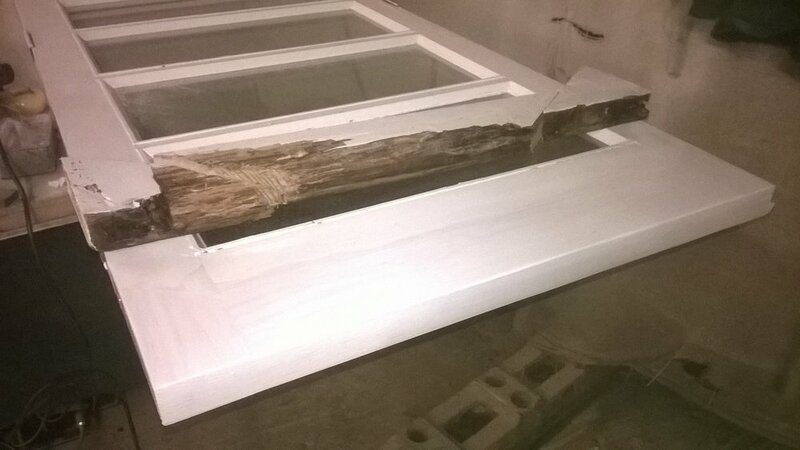 The rotten timber was removed and a new base rail and scarfed pieces made to fit. The Iron studs were replaced and the new wood was coloured down to match the existing. 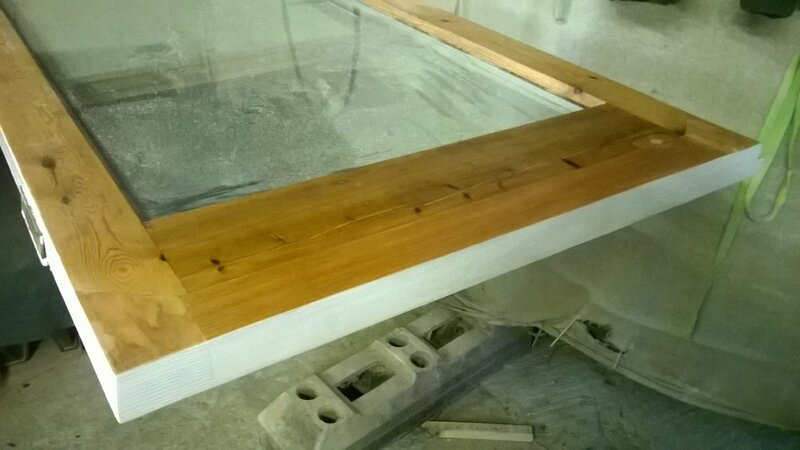 A wash of stain was applied to the whole to rejuvenate and even the tone before several coats of yacht varnish applied to seal and protect the wood. A final coat was applied after a fine sand to cut back and level the surface. 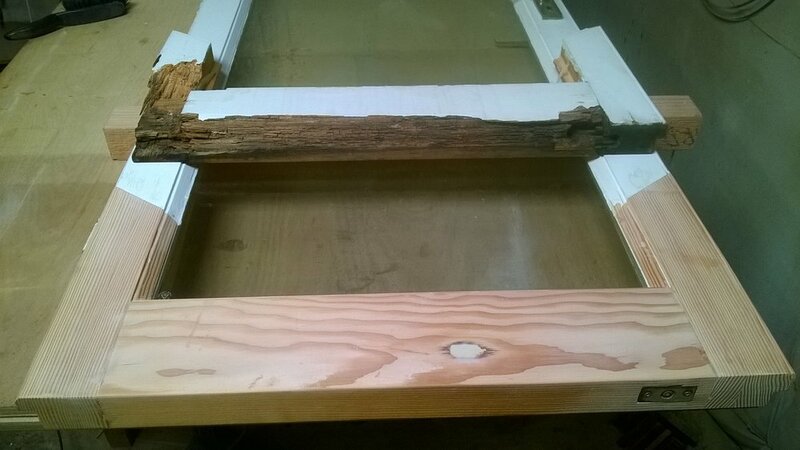 I was recently asked to make a similar scarfed oak repair to another exterior door at the property. The owner wanted an 'honest' look and so the wood has been left natural and will age and weather down in time. 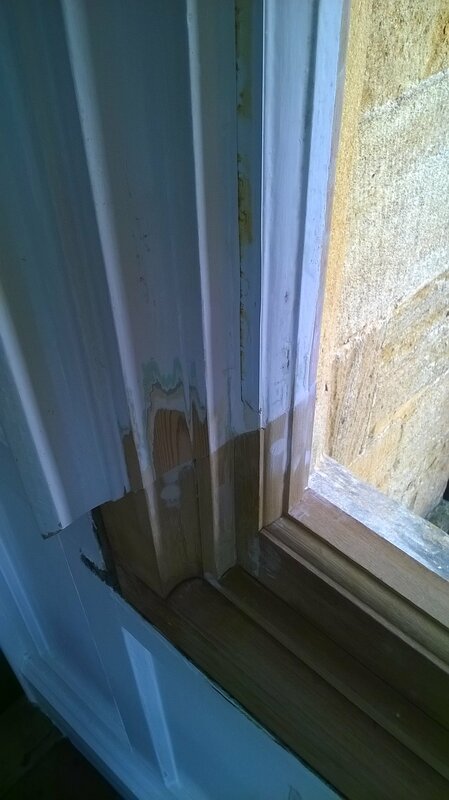 Close fitting replacement timber and epoxy resin will ensure a durable weathertight finish. 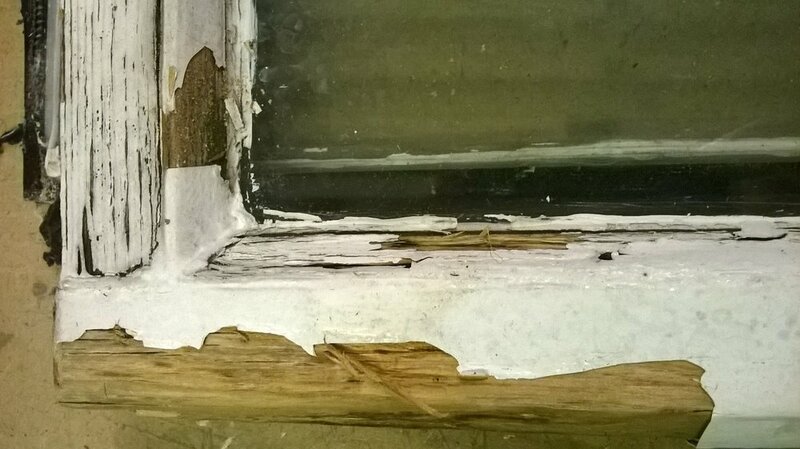 Windows from a listed building had suffered typical rot along the lower edges. The owner was keen to keep the originals so mouldings were copied and new sections made and scarfed in. Having been removed from its site due to re-flooring work, I was asked to restore and refit this screen to its original position in a converted church. It was in a tired and faded state and was refreshed and cleaned using hand applied finishing techniques to bring it back to life. The first four pictures below show its before work state, the latter show the screen refinished and refitted. The original colour was found on a section shielded from the sun. Dating to 1817, this John Broadwood piano had plenty of wear and fading. My before pictures did not turn out well so the images below show partway and finished result. Restored and French polished - finished with a good polish compatible wax. A pair of cabinets, scratched & very faded - many years in the sun! The original colour was found behind the handle plates. They were stripped, coloured, French polished then waxed. The first picture below shows before on the left - after on the right.